With a suggested retail price of £79 in the UK and $99.99 in the US, the Kodak ESP 3.2 finds itself joining the entry-level multi-function printer fight. Taking on the likes of the ridiculously cheap HP Photosmart 5510 and the Canon Pixma MG3120, the Kodak ESP 3.2 offers a competitive set of features at an affordable initial cost. 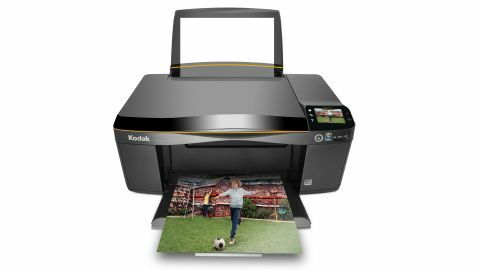 The new all-in-one Kodak printer offers wireless printing, copying and scanning - via Wi-Fi, from a computer, smartphone or tablet. The Kodak ESP 3.2 is compatible with Google Cloud Print-enabled apps and Kodak's Pic Flick and Document Print apps. There's no Ethernet connection to enable it to be hooked up to a wired network - just a USB 2.0 port. Unlike the Pixma MG3120, the Kodak ESP 3.2 features a 2.4-inch colour LCD touchscreen. And this, combined with its SD/SDHC/MMC and USB flashdrive-compatible memory card slot, means that printing can be set up without using a computer. When it comes to printing, the emphasis is firmly on the photo side of things rather than documents - and photos from mobile devices in particular. Kodak tell us that this is an area it's focused on with the development of the ESP 3.2, and the printer can output prints up to A4 size, at a resolution of 9,600dpi, from iOS, Android and BlackBerry devices. In terms of inks, the Kodak ESP 3.2 is compatible with the Kodak 30 series of pigment-based ink cartridges. It's the familiar setup - one cartridge for black ink, plus another larger cartridge that contains cyan, yellow and magenta. This being an all-in-one, the Kodak ESP 3.2 offers scanning and copying in addition to printing. Scans from the Kodak ESP 3.2 are made at 1200dpi, with multiple photos able to be scanned at once and separate files generated automatically. These files can be transferred to computer, memory card, email, Google Docs or network folders. Build quality is in line with what you'd expect at this price point. Superficially, the Kodak ESP 3.2 is similar to the Kodak ESP C110/C310 - a blend of gloss and matt black plastic finished with a yellow trim - and its light weight makes it easily transportable. It's certainly a good option if you don't have the necessary space in your home for a printer to become a permanent fixture. The Kodak ESP 3.2 is simplicity itself to set up, too. Positioning the printer head, adding the two ink cartridges to the chassis and letting the printer run through its initial calibration and test print routine takes just five minutes. The printer keeps you informed of proceedings through its excellent 2.4-inch touchscreen display. If you've struggled with setting up a regular desktop inkjet printer, let alone an all-in-one, then you're certain to find the steps the Kodak ESP 3.2 guides you through to be extremely clear and helpful. It's the Kodak ESP 3.2's larger touchscreen that differentiates it from the Kodak ESP 1.2 all-in-one, released at the same time in the UK only for the slightly cheaper price of £69 (around $110). The Kodak ESP 1.2's comparatively tiny 1.5-inch display only features a touch panel surround, and that makes things less intuitive. Otherwise, specifications, output quality and print times are shared across the two models.